The movie opens up with the newspapers on the London streets reporting the current rash of "Pyjama Suicides." Where is Sherlock Holmes people are asking. He is in Scotland fly fishing with Watson. Watson: I'd say hadn't we better get back to London at once with all this murder afoot? Holmes : I'm sorry, Watson, the pleasure of the chase are no longer for me. I'm through with crime now and forever. Watson : You, you don't mean that. Holmes : Watson I have a confession to make to you. I'm no longer equal to it. Lately I've been subject to the most alarming dizzy spells. When Holmes faints and falls in the river, the death of Sherlock Holmes in broadcast in all the papers. Dr. Watson and Mrs. Hudson sadly reminiscence about Sherlock. Sherlock walks in disguised as a messenger. He says some negative things about Sherlock and Watson punches him in the face. 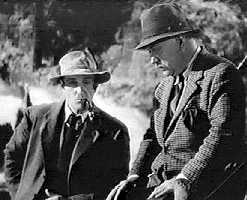 Sherlock Holmes: Directing them is one of the most fiendishly clever minds in all Europe today. I suspect a woman. Dr. John H. Watson: You amaze me, Holmes. Why a woman? Sherlock Holmes: Because the method, whatever it is, is particularly subtle and cruel. Feline, not canine. Inspector Lestrade: Popycock. When a bloke does himself in, that's suicide. Sherlock Holmes: Unless a bloke is driven to suicide; in that case it's murder. Dr. John H. Watson: Driven? That *sounds* like a woman, doesn't it? Sherlock Holmes: Definitely - a female Moriarty. Clever. Ruthless. And above all, cautious. "If we are to set a trap for this femme fatale I see no reason why we shouldn't bait it with the kind of food she likes." Holmes says. He sees a pattern that all those committing suicide are gamblers. So he puts a blurb in the paper about a new arrival from India. Sherlock shows up at the gaming tables with a turban and a beard. He is met by the Spider Woman, Adrea Spedding. When he loses at the table she offers him a loan if he will "temporarily" name her as beneficiary of his life insurance policy. It doesn't take The Spider Woman, played by Gale Sondergaard , too long to figure out who he really is and she is soon plotting his real death. A huge spider makes its way in through the window and towards Holmes' bed. Holmes smashes it before it reaches the dummy he had in the bed. This is how the suicides have been committed. When a spider expert shows up in a beard and glasses Watson thinks it is Holmes in disguise and tries to pull off his beard. Adrea Spedding comes to visit Holmes. She says she wants Holmes help to find Rajni Singh, who was the character Holmes played. It is a game of cat and mouse and they both know it. "Till we meet again." "Soon I hope." While she was there she poisoned both of them and then started a fire in their place. But Holmes drags Watson out and saves them both. Watson : Holmes where have you been all this time. Holmes : I've been going round and round in a circle. Holmes : Yes but my heart wasn't in it. The movie only runs 63 minutes, but it is really good. Probably the best of the Rathbone series.